Students from Peoples’ Self-Help Housing’s College Club educational program were recognized at a special College Signing Day celebration on May 6. Click here to see more photos. San Luis Obispo, Calif., May 17, 2018 – This month, Peoples’ Self-Help Housing (PSHH) celebrated College Signing Day and the hard work and dedication of its students. 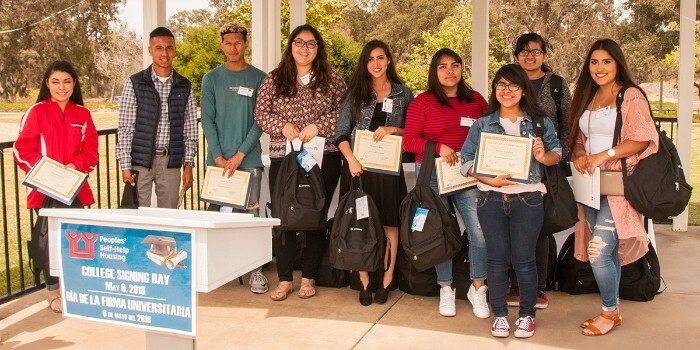 Showcasing scholastic achievement, the ceremony was held May 6 in Orcutt, CA and honored students living at its properties, who have committed to attending college, many of whom will be the first in their family to attend. All of the honorees are members of PSHH’s College Club, a program providing students a vibrant environment to prepare for and succeed in higher education. Through mentorship and ongoing emotional support, the program continues its support to students beyond high school, throughout their studies at college and even to those advancing to master’s degrees. This year, College Signing Day participants accepted offers to attend UC Santa Barbara, UC Davis, Cal Poly SLO, Cal Poly Pomona, CSU Channel Islands, Northern Arizona University, Laguna College of Art + Design, Cuesta College, Allan Hancock College and Santa Barbara City College. College Club is a part of PSHH’s year-round programming, which offers on-site educational support for children from kindergarten through college. Dedicated educators focus on building academic skills and fostering a lifelong love of learning. For more information or to support financially, please visit pshhc.org. Launched in 2014 by First Lady Michele Obama, College Signing Day celebrates the importance of reaching past a high school education whether at a professional training program, community college or a four-year university. Founded in 1970, PSHH is the largest nonprofit affordable housing developer on the Central Coast. With a mission of building homes and providing site-based services that offer opportunities to change lives and strengthen communities. PSHH serves low-income working families, seniors and veterans and provide welcoming environments for those living with disabilities and the formerly homeless. It also provides homeownership opportunities through an owner-builder, “sweat equity” program that has seen nearly 1,200 homes successfully constructed. Through its properties and offices, PSHH has a presence in San Luis Obispo, Santa Barbara and Ventura counties, manages over 1,800 rental units, and employs nearly 200 staff members. For more information on PSHH, visit www.pshhc.org, email info@pshhc.org or phone (805) 781-3088.